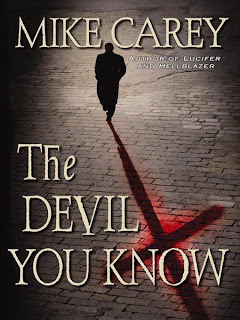 Felix Castor is a freelance exorcist, and London is his stamping ground. At a time when the supernatural world is in upheaval and spilling over into the mundane reality of the living, his skills have never been more in demand. A good exorcist can charge what he likes — and enjoy a hell of a lifestyle — but there's a risk: sooner or later he's going to take on a spirit that's too strong for him. After a year spent in 'retirement' Castor is reluctantly drawn back to the life he rejected and accepts a seemingly simple exorcism case — just to pay the bills, you understand. Trouble is, the more he discovers about the ghost haunting the archive, the more things don't add up. What should have been a perfectly straightforward exorcism is rapidly turning into the Who Can Kill Castor First Show, with demons, were-beings and ghosts all keen to claim the big prize. I've never read this comic before but it's pretty dark for the funny pages and it's hilarious. The art is nothing to write home about but Pastis makes the most of his ability by crafting simple but well designed characters such as Rat and Pig. The jokes are what makes the comic soar. I'm not about to start reading the funnies again but I would consider myself a fan of this strip from now on. It's great. This trade paperback collects the initial 10 issue run of the comic from the 70's. I never read these as a kid. I saw them and loved the art but never actually read them. The art is spectacular. Wrightson is a great artist. The writing is...well...it is what it is for an early 70's horror/hero comic. I got bored with the words and concentrated on the art. Pearls is my favorite currently running strip! I've been reading it for years. It is not in my local paper here in Waco, but I subscribe through Comics.com and get it delivered daily by email -- http://www.comics.com/comics/pearls/ . I'll have to email you a batch that I've saved through the years that were exceptional, many of which have pseudo or overt religious references.